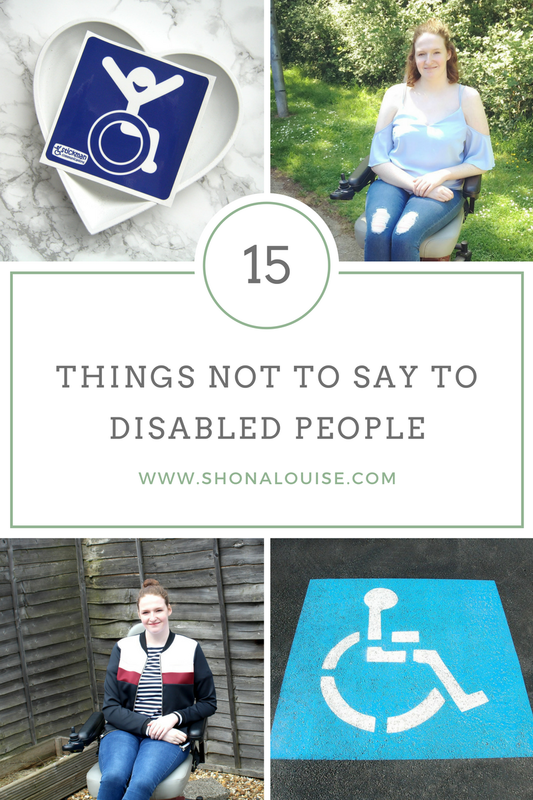 Last year I wrote a post titled '15 things not to say to disabled people' that ended up being the 6th most popular post on my whole blog. I never expected the reaction it got or how many people could relate to what I said and so of course my immediate reaction was; I have to do a part 2! All 15 points for part 2 have been sitting in my drafts for about 6 months now and I think it's finally time that I put it all together and posted it! So, here are 15 more things not to say to disabled people. 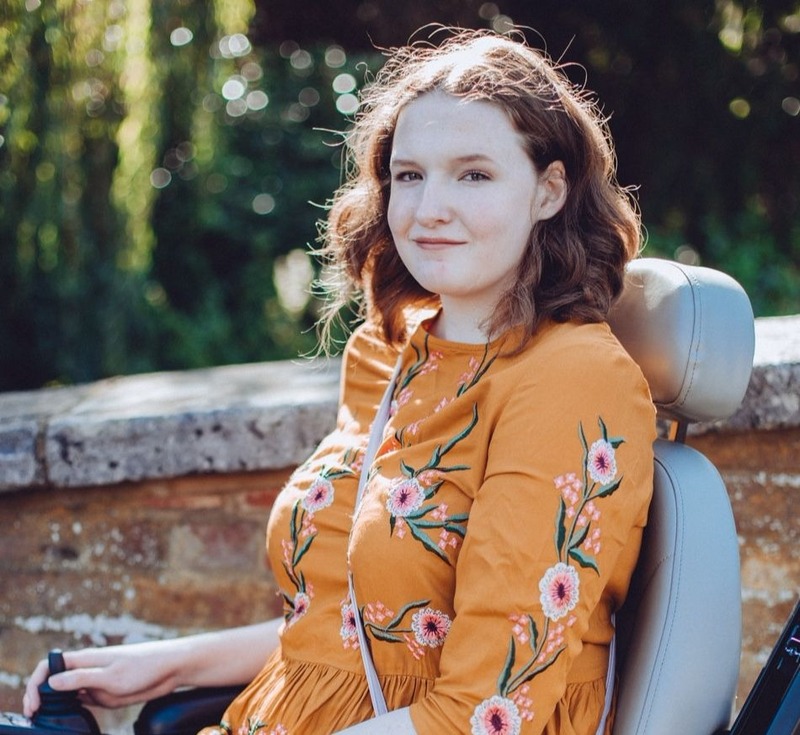 *these are mainly points written by myself so of course not every disabled person will agree with them and also I have a physical/mobility disability so these points reflect that, keep that in mind. 1. If you just keep believing, keep having a positive attitude then you'll get better! Our mind's are capable of amazing things but I can guarantee you that having a positive attitude will not alter my genes and reverse my incurable condition. 2. It must be so fun getting to skip queue's all the time. Firstly, disabled people don't get to skip queue's as much as you think, especially people with invisible disabilities. Secondly, all the issues we face in life are not worth the queue's we get to skip, believe me. 3. But aren't you on pain relief? How can you still be in pain? I have tried a lot of pain relief in the past 5 years and none of them have ever totally relieved my pain. For most of us pain relief is there to give us a small level of comfort, it rarely relieves all pain. 4. But you were fine yesterday? Every day is different, even conditions that people assume to be quite stable can produce totally different symptoms on one day compared to the next. My pain can be 10/10 one day and 3/10 the next. I can walk inside my home without crutches one day and then have to use them the next. 5. My friend is a wheelchair user too, you must know them! Believe it or not, not all wheelchair users know each other or are friends! 6. I'm so sorry that you're disabled. Why are you sorry? I've done things that others my age will never do, it's given me opportunities I never could have imagined I'd get. 7. It must be so fun getting to stay at home all day. Oh yeah, Jeremy Kyle repeats and silence are my favourite kind of day. Being off work/school sick for a few days might be a welcome break but when that becomes weeks, and then months, and even years, the novelty wears off. 8. Using a wheelchair will only make you worse. Wheelchair's give people freedom, it gives them opportunities and open's up doors that might have been previously closed. We need to stop viewing wheelchair's as bad things, as an enemy. I'd be totally housebound without my powerchair, it's given me back my life. That's really not how it works. All health problems are difficult to deal with, whether it's for 6 weeks or 6 years. 10. There's always someone worse off, just remember that. That's like saying to someone 'there's someone happier than you so don't be happy'. This is such a blunt and insensitive question, unless you know the person well, understand their health personally and the question is appropriate for the conversation, do not ask this. Disability and illness cause symptoms, do not be surprised when people have to act on problems that their condition causes, and certainly do not question it. If a disabled person tells you that something you have said is offensive/ableist then take their word for it, non-disabled people do not get to decide what we find offensive. 14. Oh, you aren't using your *insert mobility device/daily living aid*, you must be getting better! The lack of a mobility device or daily living aid doesn't necessarily mean someone is getting better, most of the time it just means that their likely variable condition is temporarily better that today, tomorrow could be quite different and they could be back to using the equipment. Do not make assumptions. Now, this is going to be a personal one. Some people don't mind being called brave. A lot of us don't like it though, I recommend you read this Metro article which includes lots of different reasons and opinions about why some of us don't like being called brave, a quote from me is included. What else do you dislike people saying to you, as disabled person? People can be such dicks. Great post. Some people really can be inconsiderate & just don't think ! Fab post lovely ! True! I just wish there was a reply to the ever present pitying looks. When I use a device, I can count at least a dozen of those per hour. And there's no response, except to scowl. Oh I can't stand the pitying looks, especially when I'm having a fun day out and people just assume I must be miserable because I'm disabled! Really?! Okay, you take my vacuum of energy and I'll have your family life, social life, and anything else you do that requires actually being awake. I'll warn you, though, it's actually pretty pants having LITERALLY NO CHOICE in the matter when you just can't wake up until the evening, and feel like you have lead limbs and a drained battery when you finally do. But hey, you'll like it, right? You sais it yourself, it *must* be nice to sleep all weekend. Nope, no exchanges when the novelty wears off - I did try to warn you, it's not my fault you didn't listen! The same goes for 'I wish I could nap when I get home from work'. No, you want to choose to take a nap. You don't want to be forced to do so when your body just shuts down.